After Coachella rumors and Stephen Colbert no shows, Daft Punk have finally come out of hiding and performed live for the first time since the release of Random Access Memories and the second time on television in the group’s entire history. Donning all white versions of their helmets the duo accompanied Niles Rodgers, Pharrell and Stevie Wonder on stage as they performed “Get Lucky,” classic Chic and Wonder tracks, and a handful of Daft Punk samples. 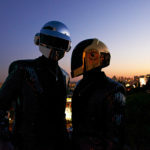 Symbolically and literally merging live instrumentation with a robotic foundation, Daft Punk and Co. set the stage for electronic dance music to finally transcend completely into mainstream popular culture. With a legendary performance and a five for five Grammys sweep under their belts, it’s safe to say that last year’s buzz about the robots’ return wasn’t overhyped after all. Check out our Best of Instagram: Grammys Edition.